The Democratic Party should be ashamed of themselves. They have become the new hate-mongering party! Their bigotry, racism, and hatred are taking us backwards. Their members’ attack friends, allies, and patriots of this country. And these bigots are worshipped and placed on the cover of Time Magazine. To the 3,000 that were killed on 9/11, it is a disgrace. To this great nation, it is bringing us down from being a light unto nations to ushering in darkness and prejudice. 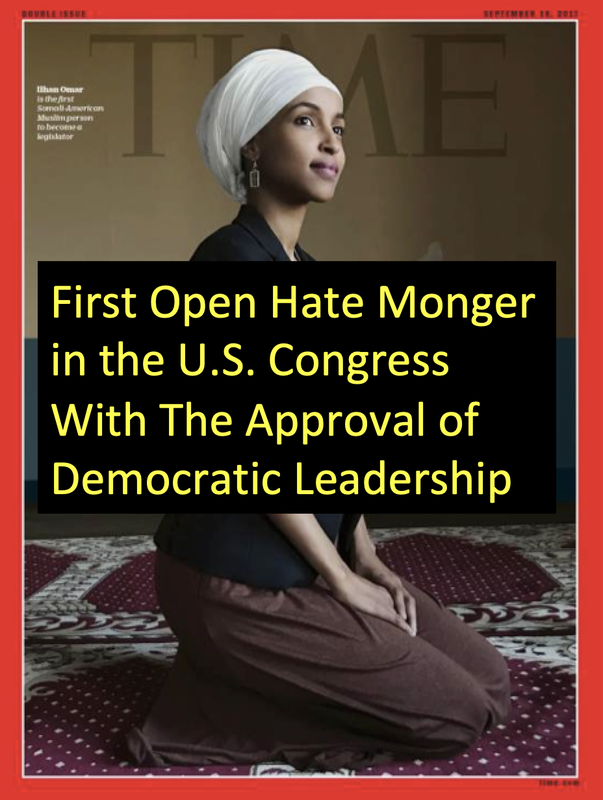 Shame on Pelosi and Schumer and the other democrats who are allowing extremism and hate to dominate their agenda. Then they hated on Israel and the Jews. Who are they coming for next America? However, it wasn’t only their predictions of a sweeping Trump loss that were incorrect, but also that their biased, schlock journalism was professionally and ethically wrong! It used to be we could go to an esteemed newspaper like the New York Times and get real investigative journalism, and a real analytical and balanced approach to issues–we could learn something and be better off for it. But unfortunately it seems that the New York Times became exactly what it feared the most–it became biased, bigoted, and hateful. It wasn’t just an endorsement before the election, it was a barrage of months of superficial and venomous, hate-filled spew and characterizations by liberal journalists against a conservative party candidate–irrespective of what his true capabilities were and hope that he could bring to reinvigorate this nation. And this is especially the case, when racism and hatred emanate from the very top–the leader of the free world–the diametric opposite of true leadership by example and with integrity. When the esteemed President declares it’s okay to hate–less than 70 years after the genocidal Holocaust that murdered 6 million Jews–then unfortunately it’s open season once again. From The White House to the Olympics…President Obama has set a shameful, hate-filled anti-Semitic tone for his 8-year presidency. Unfortunately, this is why Congress does not get the respect it deserves. But Congressman Johnson actually questions whether Guam, an Island of 209 square miles (and U.S. territory in the Pacific with a strategic U.S. Naval Base), is going to “tip over and capsize” in the Ocean. It seems like Johnson has a huge issue with termites in terms of both calling people disgusting and derogatory names and thinking an entire Island–almost twice the size of the city of Atlanta–is going to capsize, as if from a big problem of termites. This just demonstrates how being hateful and dumb truly go together! What a disgrace on our esteemed Congress of this great country of the United States of America. So you’ve probably heard about this mammoth island of plastic garbage in the Pacific Ocean. It’s between the West Coast and Hawaii. And it’s called the Great Pacific Garbage Patch. It’s about twice the size of Texas. Now researchers are predicting that by 2050, our oceans will hold more plastic than fish! And we’re dumping the equivalent of one garbage truck of plastic into the ocean every minute. Just 5% of plastic waste gets recycled. So far there is a 165 million tons of plastic trash in the ocean right now. The plastic pieces can survive hundreds of years. We are making a darn mess of this planet. The 5 cent surcharge for plastic bags is a joke in this respect. Maybe ISIS actually won’t be the end of Western civilization, but plastic will be. I took this photo on the Washington, D.C. Metro. Only a day or two later, some ladies came to me complaining that they had been harassed on the Metro. Apparently, they had been on the platform waiting for a train and a young man was first staring at them, then coming around them menancingly, and then following them. Thank G-d, they got away, but it was a frightening situation that left them wanting to actually move away. Residents in the metro D.C area and customers of Metro should not have to ride in fear. We need more police and surveillance cameras on the Metro system now! In 8 years of blogging, I don’t think I have ever written twice about the same topic in a single day–but today, I am appalled.. In 1984, Rev. Jesse Jackson (later the democratic Presidential candidate) referred to the Jewish people and New York as Hymietown. 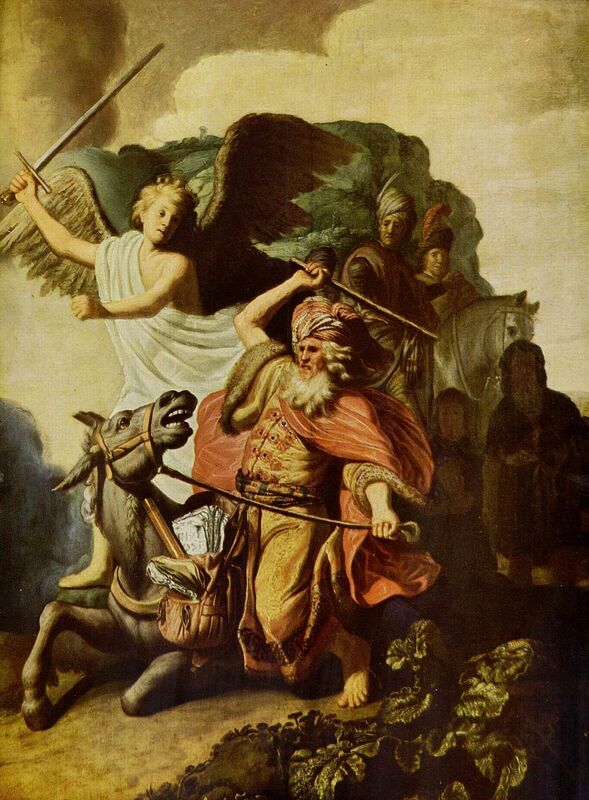 In 1624, Rembrandt painted this beautiful work from the Bible of Balaam riding on the way to curse the Israelites. Of course, the Israelites have to be deserving of this and act according to G-d’s word and by a strict moral code. For those who act shamefully, with arrogance before G-d, and unapologetically, and use their political platform to name-call, curse, and degrade Israel, no man ultimately needs to answer this, G-d provides the answer himself. Kudos to House Speaker John Boehner for speaking up against this grotesque, “disrespectful rhetoric” unbecoming the leadership of the United States of America.